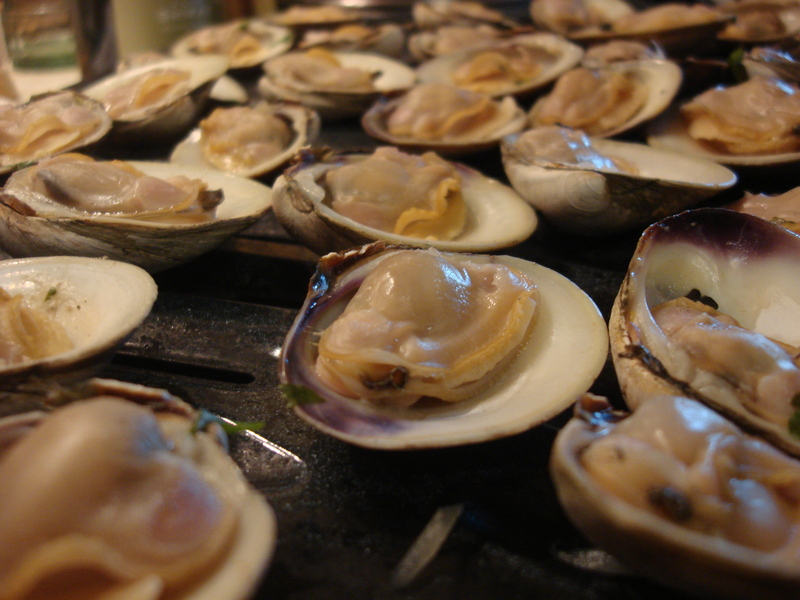 Summers on Long Island have traditionally been lined with clams. From the big surf clam shells you collect at the beach and take home as keepsakes, ashtrays, tealight holders and that are the most likely clams in your fried clam strips, to the cherrystones you burn your back and cut up your feet feeling around for somewhere in the marshy areas between Massapequa and Jones Beach, to the baked clams that are a feature of virtually every family restaurant on the South Shore, the steamers (which we call piss clams) that you eat by the bucket dipping the clams in brine and butter (after removing that weird skin – best not to discuss it), washed down with golden beers on the fishing docks of Freeport’s Nautical Mile...yeah, clams are a part of life here, especially in the summer. This is what they look like after steaming and before broiling. So never mind that the clams we used in this recipe were actually from Maryland (once again, thanks Ashley! ), it still felt like a proper kick-off to the outdoor eating season to us. This was a super easy recipe (especially because my dad was actually the one who did most of the work, while I fussed about with other things, like chilling the wine and getting my own Mussels Vinaigrette plated) and the results were phenomenal. Pedro being Pedro, he didn’t use butter, which would be traditional. Instead he used garlic-infused olive oil and I think the dish was much, much better for it. Very fresh, briny, and bracing, the way I like my seafood! The wine: one of my new favorites from Long Island – Anomaly from Anthony Nappa. It’s an unoaked pinot noir and one of the most interesting whites I have ever had. Fruity – even a bit of strawberry — but clean and soft and not at all cloying…I am really digging it. And of course Paumaonk’s Chenin Blanc, with its grapefruit, pineapply citrusy flavors is my perennial seafood partner. So, for the clams, you want the smaller clams like cherrystones which are sweeter and more tender. Quahogs and surf clams may be bigger, but they are also tougher and have other uses. They also require an overnight soak in salty water to encourage the clams to give up the grit, while cherrystones just need external scrubbing. Steam first, then finish on the broiler, then slam them home…nature’s finger food! The dad made piles of these…and they disappeared quickly! In a large saucepan, bring the wine, onion and optional parsley to a boil. Add the clams, cover and shake over high heat. After 2-3 minutes, take the cover off and start removing the clams that have opened. Cover and shake again and remove more. Those that haven’t opened after 10 minutes are probably not good. While the clams cool, heat the olive oil and garlic on low in a saucepan to infuse the oil. 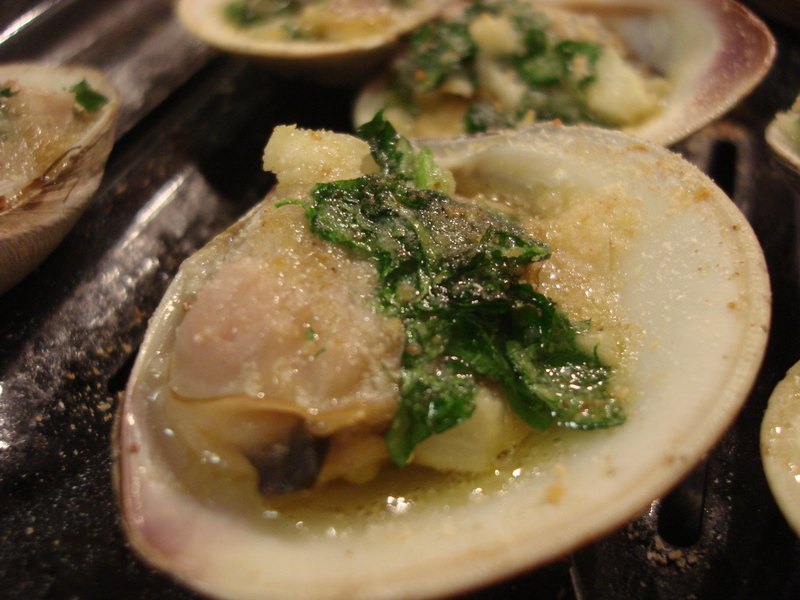 Remove the top shell from the clams and arrange on a broiling sheet with sides. 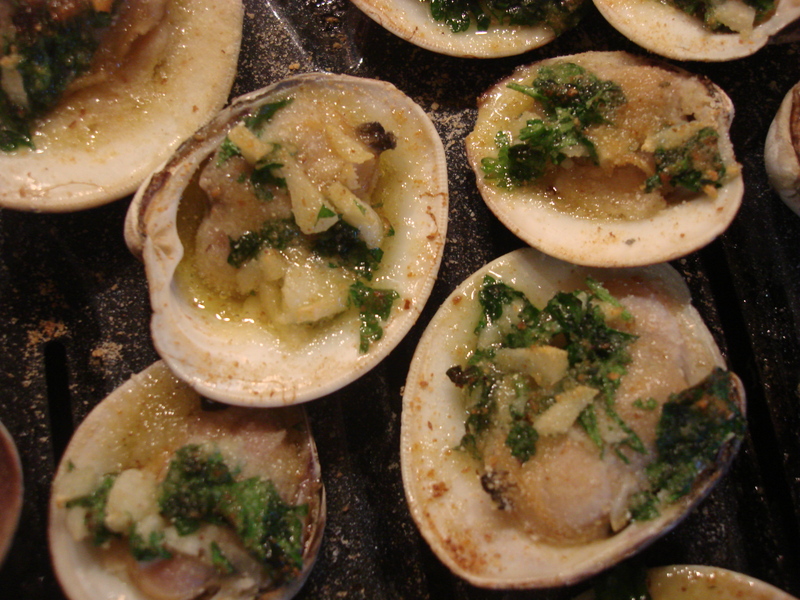 (if you are ambitious, you can separate cut the muscle that connects the clam to the bottom shell, but put them back in the bottom shell for broiling). Spoon a bit of the garlic oil on each, then sprinkle parsley and just a dusting of breadcrumbs on top. Place under the broiler (about 6” from the heating element) for a minute, until just bubbling. Mussels Vinaigrette is still in my top five. Click image for recipe! Hi Malou! I hope you get a chance to try it…the French bread and white wine sound like just the thing to go with! Simple dishes are sometimes the best and the clams sound delicious. So easy, without doubt so delicious: know exactly which counter to approach first at the famous Sydney Fish Market next fortuitous time I get there 🙂 Well, it may just be a 100 kms, but . . . Yes, the garlic and oil made me very happy…and feeling more virtuous than butter! Actually, I don’t really like butter with my shellfish,,,a texture issue as much as a flavor issue, methinks!